I missed Donald Trump’s maiden State of the Union address last night. I also heard that for the first time ever at such a televised address, the opposition party refused to clap. For anything. Evidently, there is more to which they refused to applaud that few Americans would disagree with, but you get the idea. Something hit me. Democrats and their fellow leftists, for that has become their core, don’t really hate Donald Trump. They don’t really hate Betsy DeVos (new Secretary of Education), Scott Pruit (new head of the EPA), George W. Bush, or Clarence Thomas, to name examples of people they have vilified in such unseemly ways. What they hate is the American Dream. The people mentioned above are simply folks who in some way espoused an aspect of the American Dream that came into conflict with leftist theology. Betsy DeVos wants kids living in inner cities attending rotten schools to have choice as to which schools they attend. In other words, she views the student as the “customer.” Leftists view their financial benefactor, the teacher’s union, as the customer, and attempts to block charter schools, voucher programs, and any school choice initiative because the union views these winning strategies as a threat to their power. Scott Pruitt had the audacity to assert that EPA regulations have to be lawful. His successful litigation efforts against Barack Obama’s EPA power grab put him in the cross hairs of leftist elites who view climate change as a doctrine of faith. George W. Bush was reviled for a doctrine that put American interests first and attempted to promote democratic regime change in countries with obstreperous dictators. This created flash points with the Left who believe in globalism over American nationalism. Clarence Thomas rejected Black victimhood, a core tenet of the Democratic Party. Although there are issues on which Donald Trump and the Democratic Party could find common ground, his aggressive assertion that his job as President of the United States is to put America first is anathema to the America haters on the Left. 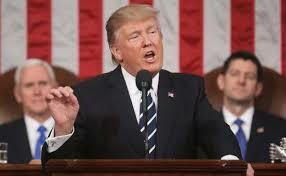 He is so unapologetic on this issue and his pledge to protect our borders, that Democrats couldn’t muster the class to even offer a dignified clap when allusions were made to the American Dream. It is rooted in the Declaration of Independence that says all men are created equal, that each person has immutable, God-given rights of Life, Liberty, and the Pursuit of Happiness. It suggests that we’re not bound by class. We can rise the ladder through our own initiatives. The Left doesn’t believe in Life, it believes in choice. The Left doesn’t believe in liberty, it believes in equality and redistributive economics. The Left believes the pursuit of happiness is all about sexual freedom and taxpayer-funded contraception and abortion; while our nation’s Founders believed it involved property and creating opportunities for each of us to succeed through free markets and representative democracy. The Left tends to dismiss God as a sentimental distraction of us little people and the American flag as a symbol of oppression, not freedom. The Democrats clearly got together and made a decision to present a unified front last night. They have a reached a point in the devolution of their party where they are comfortable publicly demonstrating their contempt for our political system, our flag, and our Dream. Whatever Donald Trump’s faults, and they are legion, he refuses to let political correctness and the thuggish tactics of the Left cow him. By all accounts, his speech last night gave America hope. By all accounts, the Democratic Party’s behavior clarified their identity. They have given up on the American Dream. It is war. Now that’s a Lenten fast! Hey Tom. We have a million. Come down and catch our act. Well, catch what we think is an act. They gave up on it a long time ago. I was 12 watching the Reagan-Carter debates. Carter was all about the best was behind us and cold showers are just fine. Reagan was NOT ok w/ any of that. I’m so glad he won 2x. My teens and young adult yrs were so much better for it. Reagan was a big influence in instilling pro life values in me. Definitely the right guy for the time. I sort of b/c a political/news junky at 12, and I’m sure Reagan had a lot to do w/ that. He made the news something one could watch w/ SOME sense of hope. Spot on. They also hate the fact that their so called, “Savior,” won’t have a legacy to stand on. Thanx! We’re here all week! I was hoping someone would get it.